Sony has announced three new digital SLRs aimed at the consumer end of the market, including what it claims is the world's lightest camera in its class. Sony has announced three new digital SLRs aimed at the consumer end of the market, including what it claims is the world’s lightest camera in its class. 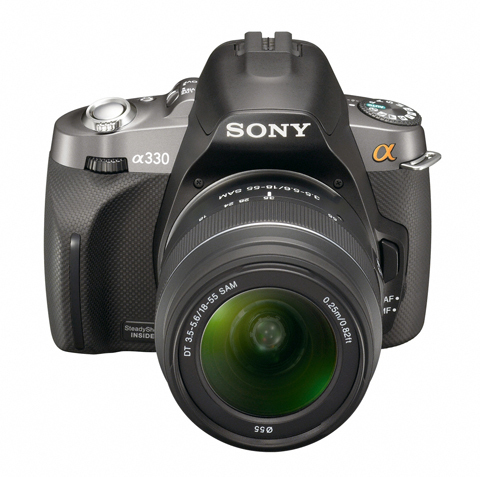 First up is the Alpha 380 which is a 14.2-million-pixel model, unveiled alongside the 10.2MP Alpha 330 and Alpha 230. The Alpha 380 and Alpha 330 feature Quick AF Live View and all three sport a 2.7in LCD screen carrying a resolution of 230,400 dots. While the monitors on the A330 and A380 can be tilted up or down, the screen on the A230 is fixed in postion. The cameras are set to replace the current A300, A350 and A200 models. Key to the new launches, according to Sony, is their ease-of-use, with the introduction of a new user interface. This includes an on-screen ‘Help Guide’ to explain the effect of the camera setting selected, along with a sample image to show the results achieved by that setting. Six scene selection modes aim to adjust camera settings according to the subject being photographed. And a graphic display is designed to help users ‘understand the relationship between shutter speed and aperture’ – and show how the chosen exposure will affect the final picture. ‘Control layout has been revised with fewer buttons, so even first-time DSLR users needn’t feel intimidated by the creative options on offer,’ said a Sony spokesman. And, for the first time, Sony has equipped its Alpha models with SD card, as well Memory Stick, compatibility. 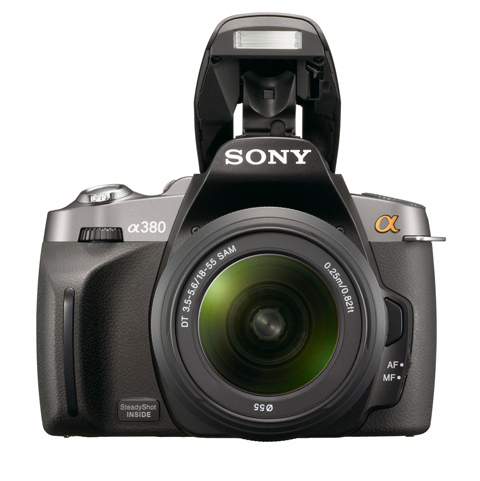 Weighing 450g the A230 is billed as the world’s lightest model with an APS-C-type sensor and built-in image stabilisation. ‘Its compact size (128x97x67.5mm) makes it great for trips away when you want to get superb pictures, without taking up extra space in your luggage,’ says Sony. ‘For even better looking pictures a newly-enhanced D-Range Optimiser intelligently adjusts exposure values in scenes containing very bright image areas and deep contrasting shadows,’ claims the firm. 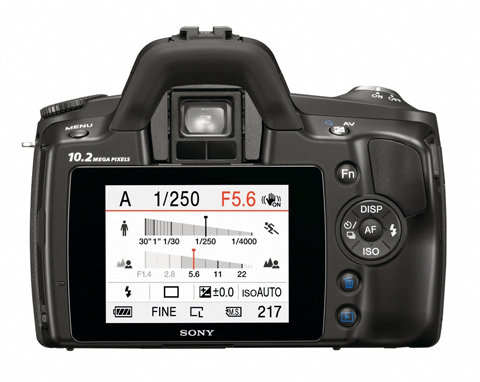 Photographers can shoot using a maximum ISO sensitivity if 3,200. Firepower also includes nine focusing points, 40-segment honeycomb-pattern metering, plus simultaneous raw and JPEG image recording . On-board dust reduction uses an image sensor shift system, plus the coating on the sensor’s low-pass filter. The camera boasts a top shutter speed of 1/4000sec, exposure bracketing in 0.3 or 0.7 stop steps, plus continuous shooting up to a burst rate of ‘2.5’ frames per second, according to Sony. Using the Live View mode – on the A330 and A380 models – 2fps is possible. HDMI output will allow images to be viewed on compatible Sony Bravia TVs. Coinciding with the launch Sony has announced a new ‘slim and light’ external flash unit called the HVL-F20AM, priced Euros 140. The A380 will be available as a kit with an 18-55mm lens, priced Euros 800. While, the A330 will cost Euros 650; and the A230 Euros 600. Sony is also set to debut a 50mm lens (Euros 165) and a 30mm Macro lens (Euros 225), first announced at PMA in Las Vegas earlier this year. The new cameras are compatible with Minolta and Konica AF mount lenses. UK prices had yet to be confirmed at the time of writing. We will bring you more news on these later this morning.